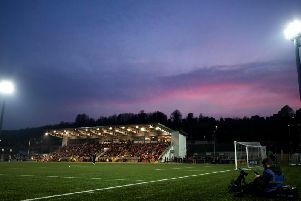 Carl Frampton was among an array of stars who turned out in force to participate in the Lap of Legends during the opening ceremony of the National Stadium at Windsor Park on Saturday night. The WBA featherweight boxing world champion received a raucous reception as he waved to fans ahead of Northern Ireland’s World Cup qualifier against San Marino. Carl Frampton with his daughter Carla. Frampton, who walked hand in hand with his daughter Carla, was joined by fellow celebrities and sports stars including Dame Mary Peters, Jimmy Nesbitt, Pat Jennings, Harry Gregg, Eamonn Holmes and Charlie Lawson.